Nokia is back with 3310 and Nokia fans are very much excited. Yes we love to have Nokia with us even with any other smarty’s in hand. The company has confirmed that the legendary feature phone will be going on sale via offline channels in four colours – Warm Red and Yellow, both with a gloss finish, and Dark Blue and Grey, both with a matte finish. For music, the device packs in a FM Radio and an MP3 player. Connectivity options onboard include Bluetooth 3.0 with SLAM for images and videos. It measures 115.6 x 51.0 x 12.8mm and weights 79.6 grams. The biggest USP of the 3310 is the 1200 mAh battery with a 22.1 hours of talk time and up to 25 days of standby time. The one launched in India is a dual SIM variant with support for microSIM. It has a coloured 2.4inch display with 240×320 pixel resolution. Nokia Series 30+, it supports 2.5G for basic internet browsing using Opera Mini browser. It features a 2MP rear camera with LED flash and as the device offers limited storage of 16MB, one can use a microSD card of up to 32GB for strong images. The legend returns! 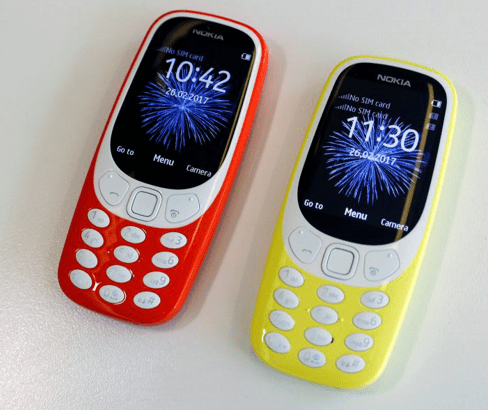 The Nokia 3310 @ Rs 3310 – in stores starting May 18!